Agriculture is New Jersey’s third-largest industry, according to the state Department of Agriculture. In New Jersey, there are 9,071 farms, 715,057 acres of farmland and 213,557 acres of preserved farmland. Farmland, forests and open space make up about 50 percent of the state’s land. New Jersey is known as the Garden State for a reason. However, some people forget that, according to Lt. Gov. Kim Guadagno. 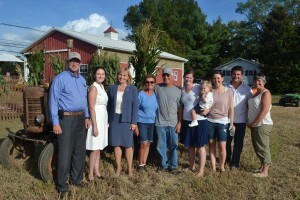 That is why she, along with state Secretary of Agriculture Douglas Fisher and Moorestown Mayor Victoria Napolitano, visited the Browning-Hess Farm, one of the oldest farms in Moorestown, on Monday Sept. 28 to highlight the state’s farming industry. “We’re here to visit the agricultural business and show what an important part agricultural businesses are to the economy, not just in Burlington County, but the state of New Jersey. 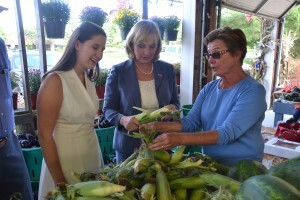 Agriculture is the third-largest industry in New Jersey, and people forget that,” Guadagno said. Moorestown has always had a history in farming. Since the early 1700s, farming was a major industry in the area. Today, while farming isn’t a major industry in Moorestown, there are still farms and farmland. “We have a long farming history (in Moorestown) and still a lot of acreage that is farmed here. It is kind of right for it to be preserved,” Napolitano said. However, keeping farmland and open space in New Jersey hasn’t been easy. From 1982 to 2007, New Jersey lost approximately 27 percent of its agricultural land to development, according to NJFuture.org. This trend has slowed, cutting in half the rate of loss, from more than 6 percent between 1997 and 2002 to less than 3 percent between 2002 and 2007. The state has taken measures to stop over development. In 2014, legislation was passed on Open Space preservation, which was designed to dedicate 6 percent of corporate business tax revenues to open space, farmland and historic preservation. Moorestown has worked hard to keep open space and farmland, according to Napolitano. Moorestown Township owned parks and conservation lands are 401 acres of developed parkland and 256.24 acres of conservation land for a total of 666.42 acres. Moorestown’s municipal land area set aside for all types of open space is 7 percent of its total. The Browning-Hess Farm has been around for more than 100 years and is the oldest and longest running family farm in Moorestown. It started in 1898 at its Lenola Road farm with 77 acres. 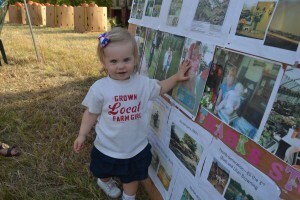 There have been seven generations of descendants running the farm. They started their market operations in 1959 and have continued to be successful. “Moorestown is a great place to have a farm. The ground is great; the location is excellent; and all of the seasons are perfect,” David Hess said. The Browning-Hess Farm thought it was in trouble when industrial developers came in nearby in the 1980s. However, both sides ended up embracing each other, and the Browning-Hess family found it was a great opportunity for the market to gain more customers. With the support of the industrial developers, the Browning-Hess Farm was able to have its farmland preserved in 2013. The Browning-Hess Farm and the old Winner farm, now the site of the Burlington County Agricultural Center and Farmers Market, are the only farms in Moorestown with preserved farmland. The Browning-Hess Farm is 40 acres and known for its tomatoes and mums. It remains open until Halloween. “We hope to be the first tomato on your table for the year and the last at the end of the year,” Hess said. Agriculture and open space are everywhere in Moorestown. Another big farm family in Moorestown is Little Hooves Romneys, owned by Ken and Charline Carlisle, who lease a majority of the land and many of the agricultural buildings at the Agricultural Center. They operate an ever-diversifying operation ranging from conventional crops, to breeding and pasturing champion sheep, to small-scale egg production. They are also vendors at the county’s on-site farmers’ market where they sell high-quality lamb, eggs and fleece. Other farms selling directly to consumers include Flying Feather Farm, Lew’s Farm Market and Flagg’s Garden Center. And there are many additional plots in Moorestown being farmed for commercial sales as well. Napolitano has made it a part of her mission to visit these farms that sell directly to consumers over the past week or two as her own way of acknowledging the agricultural industry in town.